Of all the games I've attached memories to over the years, Pac-Land has to be among the oddest. After all, it's not like this quarter-muncher from 1984 is one of Namco's most-loved releases. Hell, it's not even one of the company's most-loved Pac-Man spin-offs. I guess Pac-Land just came into my life at the right place and time. The former is especially relevant to this story, I think, considering the setting of my earliest memory of the game is a shopping-mall arcade that was located a few hours away from where I grew up. I'm sad to say I can't remember exactly how old I was when I first encountered the Pac-Land cabinet in the aforementioned arcade, but I'm pretty sure I was in my early teens. Regardless, I distinctly remember my incredulous reaction to it. After all, this was a Pac-Man game that looked and played like the original Super Mario Bros.
And don't forget: this was back when the Internet was but a gleam in Al Gore's eye. If you didn't read gaming mags at that time, you often didn't know which quarter-munchers were being released or when until you walked into your local arcade, bar, bowling alley and the like. Anyway, I was blown away the first time I laid eyes on Pac-Land. Admittedly, its odd control scheme--one button moves Pac-Man to the right, one moves him to the left and one makes him jump--leaves something to be desired, as does the repetitive simplicity of its overall gameplay, but this platformer's vividly colorful, "Saturday morning cartoon" visuals do quite a bit to make up for those flaws--or at least that's the effect they've always had on me. All of the above should help explain why the piece of art that serves as the focus of this post resonated with me as much as it did when I first came across it late last week. 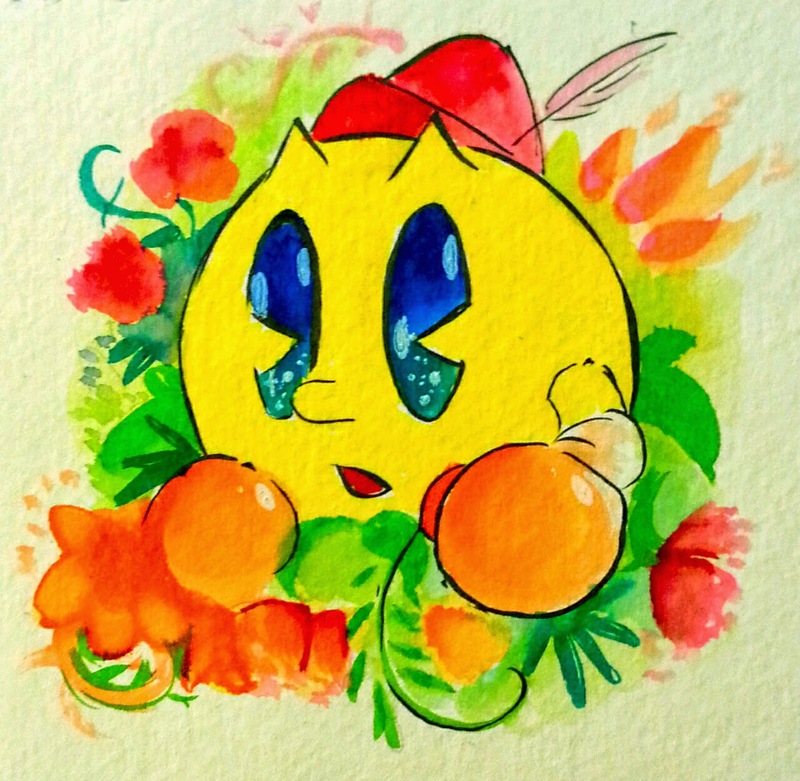 Actually, I'm pretty sure it would have resonated with me even if I weren't an unabashed Pac-Land fan thanks to the unmistakable look of innocence and wonder that's splashed across Pac-Man's face. Artist Pauli Kohberger, aka madamluna, is responsible for this winsome illustration, by the way. If you'd like to see more examples of her work--and, really, why wouldn't you?--head over to madamluna.deviantart.com at your earliest convenience. I'm sad to say my only experience with this game is through the new Smash Bros stage featuring different areas from Pac-Land, but it seems real interesting! Pac-Man games that fall off the beaten track like this and Pac-Man 2: The New Adventures are the only Pac-Man games I can really bring myself to find any interest in, mostly because of their quirkiness! I felt like they give him a lot more character than his original game, which hardly treats itself as a character game in the first place, but... yeah. Anyway, I definitely agree with you that some of the Pac-Man spin-offs did a really good job of injecting some life into the series and even character. Me, I have a peculiar fascination with Pac-Man 2: The New Adventures. It's more of an interactive animation than an action game, and certainly had no business calling itself THE sequel to Pac-Man, but I loved getting the goofy little bugger in all kinds of uncomfortable situations. Plus I'm reasonably sure it's the only game in the series where Pac-Man can eat a hallucinogenic caterpillar, with hilarious results. Sigh. You just had to bring it up again, didn't you, Jess? Now I *have* to buy some version of this game soon. I've been aware of it for years, of course, but for all sorts of reasons I've failed to play it until now. I wish the same thing, Zach! Indeed! I'm told it was called Hello! Pac-Man in Japan. Ah, there you go! That's a much better name for the game, if you ask me. Yep, I saw it. In fact, I'm pretty sure I commented on it! Just a brain fart on my part :) Anyway, some really great games were released on Wii via the Virtual Console, and there are some great WiiWare games, too. Check them out before it's too late! I had no idea there even WAS an SNES version. How did I miss that?! I was introduced to the series in the N64 version. I played a year or two of that and...I never really got into it much after that. I bought one of the Wii iterations, I think...and that was it. Seriously, Justin? That's interesting--and kind of funny (not in a bad way, though!). It'll be interesting to see if this series' gameplay appeals to me or not. Given my usual interests, I would think it would appeal to me, but you never know! I can see why you would feel that way, although personally I personally think some of the polygonal/3D versions have a lot of charm, too, such as Harvest Moon 64, Magical Melody and even The Lost Valley.